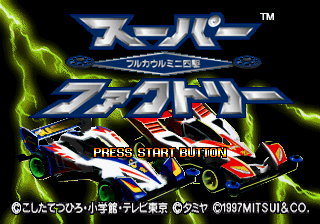 Full Cowl Mini Yonku Super Factory (フルカウルミニ四駆 スーパーファクトリー) is a 1997 game by Nextech and Media Quest tying into a toy car line and what appears to be a different anime. In it, you design a car that you want to race around tracks, but you don't actually race — the car races on its own. Main article: Full Cowl Mini Yonku Super Factory/Magazine articles. 4WD_ABS.TXT TXT (Abstract) 402 About this game.